Les Misérables is an amazing story about hard hearts becoming soft, lawlessness versus grace and redemption through death. Jean Valjean starts off as a typical criminal, taking whatever he can whenever he can. Therefore, acting on his criminal instincts, he steals some silverware from a clergyman who takes him in to feed him. But Valjean is intercepted by the police, who take him back to the clergyman’s house to inquire about the silverware. The clergyman says that the silverware was his and his only issue with Valjean is that he forgot to take the candlesticks too. This unexpected show of mercy not only keeps ValJean from heading straight back to prison, it frees him from his enslavement to selfishness and crime. Valjean breaks his parole and flees in search of a new life. ValJean’s parole officer, Javert, vows to bring him to justice. According to the law, Javert was in the right. Over time, however, Valjean’s change of heart affects Javert. Javert pursues this law-breaker with a righteous tenacity, but he can’t help noticing the new kindness and mercy that saturates Valjean’s life. Javert can only funtion within the confines of the law. By contrast, ValJean has been freed by the infinite possibilities of grace. 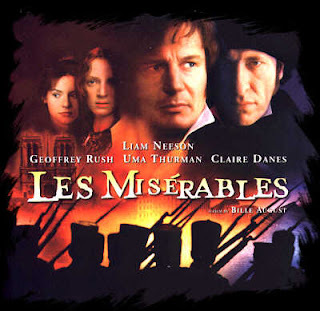 Toward the end of the story, Valjean offers his life in exchange for the young man his daughter loves. Again, Javert witnesses the new law, the law of grace that governs ValJean. But the old policeman is still compelled by the law. He cannot live while a man like ValJean is walking the streets freely. Therefore, to accomplish ValJean’s freedom and yet not compromise the law, Javert sacrifices his own life. Les Misérables is a powerful illustration of the stringent requirements of law in contrast to the freeing power of grace. Grace is superior to the law because it frees us from lawlessness and at the same time gives us a healthy desire to follow the law. Javert is no Christ-figure... mercy is obviously not one of his strong qualities. But at least he knows his trade, and sticks to it passionately. Indeed, the law is zealous in upholding itself. Javert, a true man of the law, understands the uncompromising nature of the law, that nothing short of death is required to set a man free from past sins. Javert's uncompromising character makes his self-sacrifice in the end all the more miraculous. This was the fruit of his new heart which, thanks to Valjean, had been infected with God's grace. In a similar act of mercy, God killed His own Son to save us from the eternal death that we had earned for ourselves. Through Christ's sacrifice, God demonstrates His divine justice and His divine grace simultaneously. "Now we are released from the law, having died to that which held us captive, so that we serve in the new way of the Spirit and not in the old way of the written code." A truly inspiring review. If I had not already seen the movie it would be at the top of list after reading this. I have not seen other versions of this movie yet but I do intend too. I loved the acting and Liam Neeson has always been a favorite, not to mention the suburb job of acting done by Uma Thurman and Claire Danes. Thanks for you visit. Good review bro. Most def an excellent movie. Jesus is that good man. Excellent insights. I was shocked when Javert ended his life. My first reaction was that no fallen human would follow the letter of the law to such an extent, but regardless my very reaction to it produced what the author likely intended. Javert's strict adherence to the law is meant to provoke us to consider how ultimately the law is not enough to achieve life, but instead it convicts us all to the point of death. As you said, grace in the form of the redeeming sacrifice of Jesus is God's answer to the limits of the law. What I can't forgive Valjean: he SMILED when he walked away at the end. OCCness incarnate.